The French 2nd Armored Division (French: 2e Division Blindée, 2e DB), commanded by General Philippe Leclerc, fought during the final phases of World War II in the Western Front. The division was formed around a core of units that had fought in the North African campaign, and re-organized into a light armored division in 1943. The division embarked in April 1944 and shipped to various ports in Britain. On 29 July 1944, bound for France, the division embarked at Southampton. During combat in 1944, the division liberated Paris, defeated a Panzer brigade during the armored clashes in Lorraine, forced the Saverne Gap and liberated Strasbourg. After taking part in the Battle of the Colmar Pocket, the division was moved west and assaulted the German-held Atlantic port of Royan, before recrossing France in April 1945 and participating in the final fighting in southern Germany, even going first into Hitler's "Eagle's Nest" (Americans captured the town below). Deactivated after the war, the 2nd Division was again activated in the 1970s and served through 1999, when it was downsized to the now 2nd Armored Brigade. The division was formed around a core of units that had raided Italian Libya at the end of 1940 and Tripoli in 1943 under Leclerc, but was most known for its role in the fight at Kufra in 1941; later renamed the 2nd Light Division, in August 1943, it was organized under the US light armored division organization. The division's 14,454 personnel included men from the 2nd Light Division, escapees from metropolitan France, about 3,600 Moroccans and Algerians and about 350 Spanish Republicans. Other sources give about 2,000, official records of the 2e DB show fewer than 300 Spaniards as they hid their nationality, fearing retaliation against their families in Spain. 2ème DB arms featuring the Free French cross of Lorraine. The division landed at Utah Beach in Normandy on 1 August 1944, about two months after the D-Day landings, and served under General Patton as part of Third Army. The division played a critical role in the battle of the Argentan-Falaise Pocket (12–21 August), the Allied breakout from Normandy, when it served as a link between American and Canadian armies and made rapid progress against German forces. They all but destroyed the 9th Panzer Division and defeated several other German units. During the Battle for Normandy, the 2nd Division lost 133 men killed, 648 wounded, and 85 missing. Division material losses included 76 armored vehicles, 7 cannons, 27 halftracks, and 133 other vehicles. In the same period, the 2nd Division inflicted losses on the Germans of 4,500 killed and 8,800 taken prisoner, while the Germans' material losses in combat against the 2nd Division during the same period were 117 tanks, 79 cannons, and 750 wheeled vehicles. The 2nd Armored Division marching on the Champs Élysées on 26 August 1944. 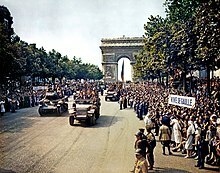 The most celebrated moment in the unit's history was the Liberation of Paris. Allied strategy emphasized destroying German forces retreating towards the river Rhine and considered that attack on Paris would risk destroying it, but when the French Resistance under Henri Rol-Tanguy staged an uprising in the city from the 19 August, Charles de Gaulle threatened to send the division into Paris, single-handedly, to prevent the uprising being crushed as was then happening in Warsaw. Eisenhower agreed to let the French armored division and the U.S. 4th Infantry Division liberate Paris. In the early morning of 23 August, Leclerc's 2e DB left the south of Argentan on its march to Paris, a march which was slowed by poor road conditions, French crowds, and fierce combat near Paris. 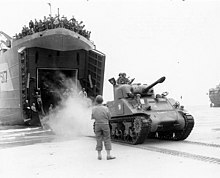 On 24 August, General Leclerc sent a small advance party to enter the city, with the message that the Second Armored would be there the following day. This party, commanded by Captain Raymond Dronne, consisted of the 9th company[note 1] of the 3rd Battalion of the Régiment de marche du Tchad. Dronne and his men arrived at the Hôtel de Ville, in the center of Paris, shortly before 9:30 pm on the evening of 24 August. On 25 August, the 2nd Armored and the U.S. 4th Division entered Paris and liberated it. After hard fighting that cost the 2nd Division 35 tanks, 6 self-propelled guns, and 111 vehicles, von Choltitz, the German military governor of Paris, capitulated at the Hôtel Meurice. The following day, 26 August, a great victory parade took place on the Champs Élysées, which was lined with a jubilant crowd acclaiming General de Gaulle and the liberators of Paris. The 2nd Division later fought in the tank battles in Lorraine, destroying the German 112th Panzer Brigade at the town of Dompaire on 13 September 1944. Subsequently, the 2nd Division operated with U.S. forces during the assault into the Vosges Mountains. Serving as the armored exploitation force for the U.S. XV Corps, the 2nd Division forced the Saverne Gap and thrust forward boldly, unbalancing German defenses in northern Alsace and liberating Strasbourg on 23 November 1944. The Presidential Unit Citation was awarded to the division for this action. Fighting in Alsace until the end of February 1945, the 2nd Division was deployed to reduce the Royan Pocket on the western coast of France in March–April 1945. After forcing the Germans in the Royan Pocket to surrender on 18 April 1945, the 2nd Division crossed France again to rejoin the Allied 6th Army Group for final operations in Germany. Operating with the U.S. 12th Armored Division, elements of the French 2nd Armored Division pursued the remnants of German Army Group G across Swabia and Bavaria, occupying the town of Bad Reichenhall on 4 May 1945. Eventually, the 2nd Division finished its campaigning at the Nazi resort town of Berchtesgaden in Southeastern Germany. According to Defence Historical Service, the unit counted 1,224 dead (including 96 Maghrebis) and 5,257 wounded (including 584 Maghrebis) at the end of the campaign in northwestern Europe. It had killed 12,100 Axis soldiers, captured 41,500 and destroyed 332 heavy and medium tanks, 2,200 other vehicles, and 426 cannons of various types. According to another source, the unit counted 1,687 dead, including 108 officers, and 3,300 wounded . On 13 May 1945, SHAEF relinquished operational control of the 2nd Armored Division to France. From 23 to 28 May 1945, the 2nd Division moved to its new garrison in the region of Paris, where it was deactivated on 31 March 1946. 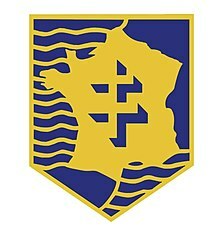 There are records from the late 1960s and early 1970s of 501 Régiment de Chars de Combat (501 RCC) being part of the 2nd Brigade of the 8th Armored Division, part of the 1st Corps of the First Army (France). The 2nd Brigade of the 8th Armored Division 'qui est l'heritière des traditions de la 2e DB' – carried on the traditions of the 2nd Armored Division. The French Army was extensively reorganised in 1977, with three-brigade divisions being dissolved and small divisions of four or five manoeuvre regiments/battalions being created. The 2nd Armored Division appears to have been reformed at this time. From the late 1970s until 1999, the 2nd Division was headquartered in Versailles and was subordinated to the III Corps (France). It became the 2nd Armoured Brigade in 1999. ^ Made up of volunteers, mostly Spanish Republicans, the 9th company bore the name La Nueve, in Spanish, for its number "nine". ^ www.evl.pl, evolution,. "MÉMORIAL DE MONTORMEL. LA DERNIÈRE BATAILLE DE NORMANDIE. AOÛT 1944". www.memorial-montormel.org. Retrieved 26 August 2017. ^ The extraordinary ratio of casualties inflicted vs. casualties suffered that was reported by this unit is at odds with the overall relation between Allied and German casualties during the battle of Normandy that becomes apparent from the data under http://www.ddaymuseum.co.uk/faq.htm#casualities Archived 21 June 2013 at WebCite. ^ There has been some confusion as to which unit actually captured Berchtesgaden, the three "contenders" being the U.S. 101st Airborne Division, the U.S. 3rd Infantry Division, and the French 2nd Armored Division. The town was captured by the U.S. 3rd Infantry Division, whose commander ensured that bridges leading to the town were not opened to other Allied units until the 3rd ID had occupied Berchtesgaden. See this article for more information. ^ "1977 OOB at orbat.com". orbat.com. Archived from the original on 28 November 2010. Retrieved 26 August 2017. ^ "1984 OOB at orbat.com". orbat.com. Archived from the original on 24 April 2012. Retrieved 26 August 2017. ^ "1995 OOB at orbat.com". orbat.com. Archived from the original on 14 June 2011. Retrieved 26 August 2017. Les Grandes Unités Françaises (GUF), Volume V, Part 2, Service Historique de l'Armée de Terre, Paris: Imprimerie Nationale, 1975. Lévy-Haussmann, Gilbert (2005). La 2eme DB vue par un 2eme classe. Aigremont. ISBN 2-9524349-0-5. Bergot, E. (1980). La 2eme DB. Paris: Presses de la Cité. OCLC 2266010670. Wikimedia Commons has media related to 2nd Armored Division (France).